This journal is published by Muğla Sıtkı Koçman University Graduate School of Natural and Applied Sciences. 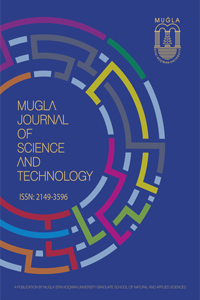 The scope of the "Mugla Journal of Science and Technology” comprises such as original research on all aspects of basic science, engineering and technology. Original research results, scientific reviews and short communication notes in various fields of science and technology are considered for publication. The publication language of the journal is English. However; English and Turkish abstracts are mandatory if accepted. Turkish language support will be given for your article's turkish summary by our experts. Please prepare your submission in MS-Word format appropriate to the MuglaJST style which is required for publication in e-journals. Please, prepare your paper according to the Pre-load template. Studies that are not suitable for this format will be REMOVED from the system without taking into consideration the evaluation process. NOTE 2: Please provide a cover letter mentioning that your manuscript is original and has not been submitted or published partially or completely in another journal, book, electronic media etc. NOTE 4: The descriptive ID information will be given in ULAKBİM TR Directory systems. It is recommended that ORCID be used for the standardization and co-operation with The Council of Higher Education (YÖK), the journals listed in or included in the TR Directory must request the ORCID information from the authors and include this information in the journals / articles.